Right now, the General Motors media site doesn’t have any official information on the 2019 Chevrolet Corvette – including the new ZR1 that is already reaching owners – but the consumer website seems to have everything that we could want to know about the new model year. Of course, there have been situations in the past where consumer websites had incorrect information, so there is a possibility that the current information could change, but right now, it appears as though the is only one change slated for the 2019 model year of the Corvette Z06. 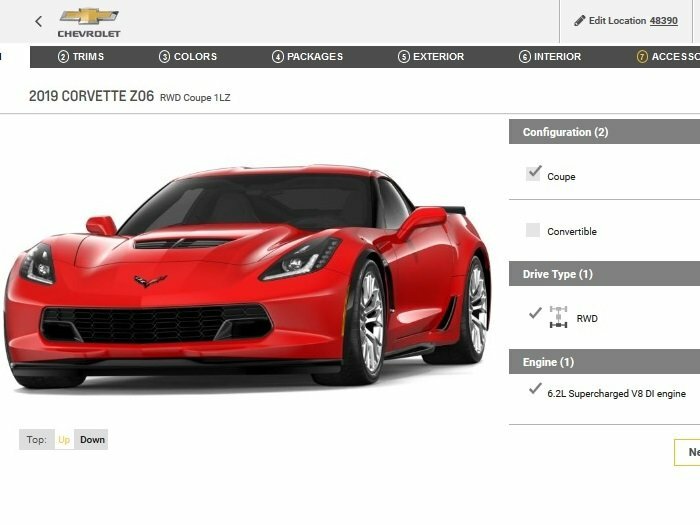 I spent some time going through each page of the configurator tool on Chevrolet.com for the 2018 Corvette Z06 and the 2019 Corvette Z06. While there are some small changes in item descriptions, I was only able to find one change for the new model year. Watkins Glen Grey Metallic is not listed for 2019. All of the other exterior colors carryover, the same interior colors carryover, all of the options and packages carryover and – most importantly – all of the pricing remains unchanged from 2018 to 2019. So, if you want a C7 Z06 in Watkins Glen Grey, you should start checking dealership inventories now, as it doesn’t appear to be coming back for the new model year. However, everything else remains unchanged, so if you have been debating whether to pick the Z06 or ZR1, and you have decided on the Z06, there are no price increases or significant changes for the new model year. The 2019 Chevrolet Corvette Z06 is still powered by the supercharged LT4, delivering 650 horsepower and 650 lb-ft of torque to the rear wheels by means of a 7-speed manual transmission or an 8-speed automatic. The 2019 Z06 is available as a coupe or convertible, with the removal hardtop model starting at $81,585 while the droptop starts at $85,585. The high performance Z07 package is still available for $7,995, adding a unique suspension package with Magnetic Selective Ride Control, carbon ceramic Brembo brakes, Michelin Pilot Super Sport Cup 2 summer tires, a clear spoiler bridge and front splitter end caps. Again, the information on the consumer site could change in the coming weeks, but right now, it looks like there will be no major changes for the 2019 Corvette Z06.